^ a b Matsuo H, Miyata A, Mizuno K (1983). "Novel C-terminally amidated opioid peptide in human phaeochromocytoma tumour". Nature 305 (5936): 721–3. ^ a b Weber E, Esch FS, Böhlen P et al. (December 1983). "Metorphamide: isolation, structure, and biologic activity of an amidated opioid octapeptide from bovine brain". Proceedings of the National Academy of Sciences of the United States of America 80 (23): 7362–6. ^ Sonders M, Barchas JD, Weber E (August 1984). "Regional distribution of metorphamide in rat and guinea pig brain". Biochemical and Biophysical Research Communications 122 (3): 892–8. ^ Miyata A, Mizuno K, Minamino N, Matsuo H (May 1984). "Regional distribution of adrenorphin in rat brain: comparative study with PH-8P". Biochemical and Biophysical Research Communications 120 (3): 1030–6. ^ Miyata A, Mizuno K, Honzawa M, Tohyama M, Matsuo H (February 1985). "Adrenorphin immunoreactivity in rat brain". Neuropeptides 5 (4–6): 517–20. ^ Xu SF, Lu WX, Zhou KR et al. (April 1985). "The analgesic and respiratory depressant actions of metorphamide in mice and rabbits". 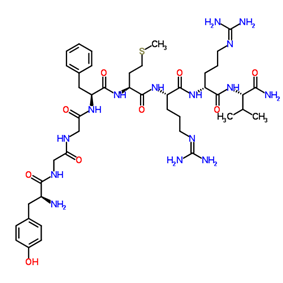 Neuropeptides 6 (2): 121–31.